At Treeo Orem we know our residents have incredible life stories and we love to celebrate them! 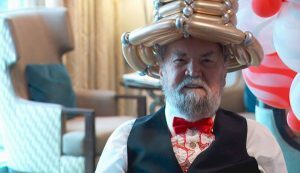 Treeo Orem resident Marvin Hardy spent 30 years as a pioneer in the balloon art industry. Marvin is credited with inventing the long, tubular balloon that is so popular with balloon artists and entertainers today. He traveled the world with his wife, Penny, teaching people how to make beautiful designs with this new balloon style. Over the years, Marvin has had many students who have gone on to make a career with balloons. As a tribute to Marvin and Penny, who are both battling stage 4 cancer, many of these professional artists gathered together at Treeo Orem for three days, donating their time and talents, to create all the gift of a lifetime with nearly 5,000 balloons. Nearly every corner of the community room and dining room were adorned with balloon statues, arches, and table decorations. It was unlike anything the residents and staff had ever seen. As the balloons started to take shape, residents were able to invite family members over to experience all the fun. Young grandchildren and great-grandchildren especially enjoyed all the colorful creations. 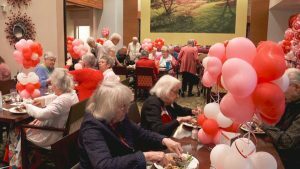 Residents were entertained with Las Vegas-style piano music while they enjoyed a meal of filet mignon and grilled shrimp. Balloon artists also made specialized balloon teddy bears, flowers, and wrist corsages for residents and guests during the party. Word about the party also reached the local news. KUTV Channel 2 News spent most of the afternoon filming and interviewing staff and residents. Residents enjoyed watching the story on the evening news and reading the story online. Each month Treeo hosts a fun, themed party which is open to residents and prospects. Give us a call at 801-434 -8000 today to get your name on the guest list for our next event.